Clean fluids - Perfect Surfaces ! 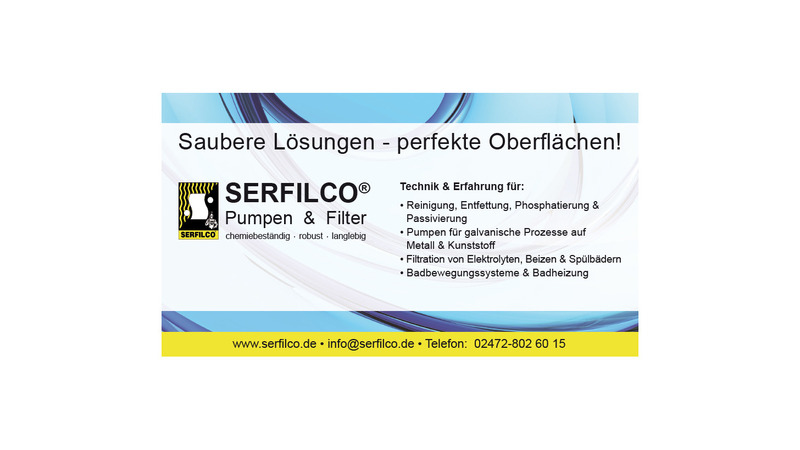 SERFILCO - Expertise for over 50 years. Offer a range of pumps, filters and combined systems plus SerDuctor airless agitation systems give optimized solutions for nearly all applications in the surface treatment industry especially for galvanizing & surface treatment of metals, Plating on plastics, manufacture of printed circuit boards and surface treatment of Aluminium. A wide range of pumps for the safe handling of aggressive, corrosive or toxic fluids covers all processes from pre treatment (cleaning/degreasing/phosphating/passivating), galvanizing baths, post-treatment (purging/sealing) up to process and waste water treatment. Users can choose between vertical, horizontal, magnetic coupled centrifugal pumps in PP, PVC-C PVDF, Stainless Steel, Noryl or Ryton to fit their individual purposes best. A range of air operated diaphragm pumps is also available. A comprehensive range of filter vessels and complete filter systems in PP, PVC-C, PVDF or stainless steel ensures perfect synchronized technology from one source. Whatever your space requirements you can choose between systems for in tank or out of tank mounting. For efficient filtration of organics all systems can be combined with activated carbon by-pass filters. For larger volumes SERFILCO provides the fully automated Titan Range which uses permanent filter media, with a backwash cycle for regeneration.Capacities up to 22m3/h for cleaning fluids up to 85°C, 68m3/h for acid or alkaline fluids like zinc, copper or nickel electrolytes in galvanizing or surface treatment industries and up to 95m3/h for waste water. Recently launched the JM & FM Range of filters offers cartridges, bags or discs in one simple design with capacities from 10m3/h up to 35m3/h.